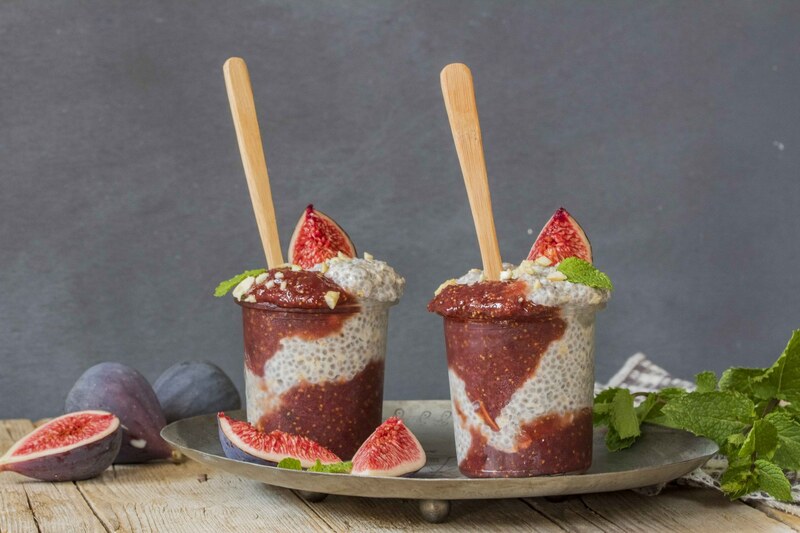 Prepare the oat flakes and chia pudding the night before. 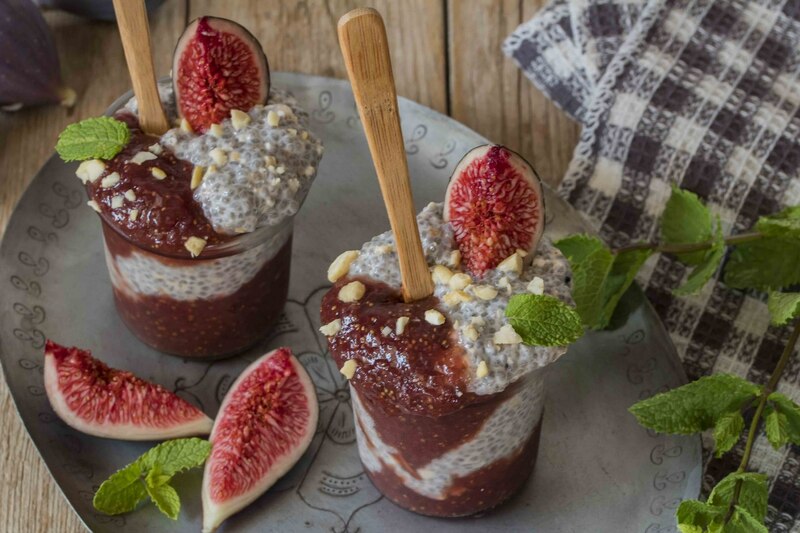 The chia seeds will swell, become softer in texture and give a jelly texture to the pudding. I made the jam before. On the website is a recipe of fig jam with ginger and clove. I prefer to use homemade jam because I do not add extra sugars and like to have pieces of fruit. Be aware that jam with less sugar can not be kept for a long time. It does not have to be a fig jam, you can choose any other one ... according to your taste and choice. Cut the vanilla stick lengthwise and scrape out the seeds. Mix the almond milk, oat flakes, chia seeds and vanilla seeds. Put this mixture in the fridge during the night. In the morning you add an extra spoon of almond milk and stir well until it is smooth again. (maybe you need to add some extra milk.) Chop the almond nuts. Divide between two jars, alternating both the oat pudding and the jam. Sprinkle the finely chopped nuts on top. Finish with a little mint leave. Contain dietary fiber that lower cholesterol levels. Longer saturated feeling that can counteract the "extra - in between - snacks". Chia seed comes from the flowers of a Mexican mint plant Chia. Contains many proteins, antioxidants, minerals and the healthy fats omega-3 acids. Before use, briefly crush in the mortar. Ensures a jelly binding in pudding.